- Publisher This child-centered approach to Christianity is suitable for use in schools, churches, and at home. Key ideas are explained, and an everyday theme is taken that children should recognize and understand through the simple words and pictures. This book is a discovery of the work and character of God, through his world and his relationship with people. - Publisher Just look at the amazing plants around you...all the plants and animals that live on the earth and in the sea-and all the people of the world. There is so much to wonder at, so much variety and detail. But why does the world exist at all?The Bible, the special book of Christianity, says that God made the world. Everything exists because God wanted it to and loves it.This book will open your eyes to the word-pictures in the Bible that show what God is like.Words and pictures capture the interest and imagination of children aged 5-8Each double page provides a key concept. These concepts build children's understanding of the Christian faith. 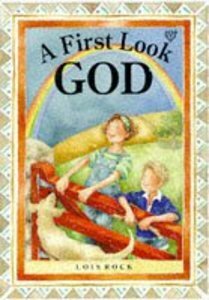 About "God (First Look Series)"
This child-centered approach to Christianity is suitable for use in schools, churches, and at home. Key ideas are explained, and an everyday theme is taken that children should recognize and understand through the simple words and pictures. This book is a discovery of the work and character of God, through his world and his relationship with people. Just look at the amazing plants around you...all the plants and animals that live on the earth and in the sea-and all the people of the world. There is so much to wonder at, so much variety and detail. But why does the world exist at all?The Bible, the special book of Christianity, says that God made the world. Everything exists because God wanted it to and loves it.This book will open your eyes to the word-pictures in the Bible that show what God is like.Words and pictures capture the interest and imagination of children aged 5-8Each double page provides a key concept. These concepts build children's understanding of the Christian faith.